In our previous posts, we’ve talked about the exterior of the Cleveland Medical Mart. In this post, we move into the interior to talk about how we are using daylight inside the building. A major feature of the design is a large central atrium with a four-story structural glass wall facing the Mall. While providing a good amount of natural light to the atrium, this entirely glazed edge also contrasts greatly with the three other non-glazed walls. We knew we needed a strategy to more effectively balance the light levels throughout the space, and our goal was to achieve that with natural lighting. Design with daylight is as much an art as a science, but we knew that we would need to come up with a light-harvesting solution that included the ceiling as well as the curtain wall. At the outset of any climate sensitive design, the first thing to do is understand the weather and conditions on site. The best source of weather data is the EnergyPlus TMY3 file. TMY3 data is not available for all sites, but in the case of Cleveland, we were able to find high-quality weather data from about a mile away. Though TMY3 data contains illumination ranges, what we really want to understand is how sunny or cloudy it is during our typical design conditions. The best metric is a Sky Cover analysis, for which we used Climate Consultant 5 to graph the ranges. Being from Seattle, we needed to recalibrate our sensitivities (we don’t get a lot of sun here) to the existing conditions on site in Cleveland. The graph on the left shows the average month-by-month and annual sky cover for Cleveland, OH. (Click on the graph to get a closer look). These data were derived from the TMY3 data in the EPW file for the Burke Lakefront Airport, which is very close to the building site. As you can see, Cleveland is fairly cloudy. The lowest sun angles are during the month of December…Cleveland’s cloudiest month. Though glare is often experienced during overcast skies, glare during the clear morning sun is less of an issue than harvesting the maximum amount of light during the darker periods of the year. It is important to include the overcast December 21st design condition – the worst-case condition with regard to amount of light – in the mix. The autumnal equinox (March 21st) and the summer solstice (June 21st) were also included. We determined – due to the variable sky conditions during our chosen dates – to test each date under both clear and overcast skies. It was important to minimize potential sources of glare during periods of plentiful overhead sunlight – during spring and summer – but, even though the atrium will be a great source of shade during the warm summer, we did not want it to feel like “a cave” from a lighting perspective. Additionally, in order to reduce the lighting power density and reliance on electric fixtures, we needed to make sure that our daylight schemes met the IES NA standards. However, our end goal was not to just meet the minimum standards, but create a dynamically changing space that is comfortable, efficient and beautiful. As you can see, we performed a comprehensive site analysis with an aim to maximize daylight from the ceiling. We made extensive use of Ecotect as a handler for the Radiance lighting simulation engine. Radiance allowed us to generate both luminance images (as a camera or an eye sees) and illuminance (light falling on a point) measurements. The luminance images allow for both a qualitative and quantitative reading of the space. Each pixel in the synthetic High Dynamic Range image contains photometric data about intensity of the luminance flux. This is great for identifying areas of potential glare (more on that below). The images also read well as renderings of relative intensities of light. As is clear from the summary, relying on the east glazed facade alone would require significant electrical lighting to meet the minimum IES standards. Predictably, as we increased the number of skylights, the overall foot candle levels increase, but the distribution becomes important. Adding more lights to the west of the space complemented the east glazed opening. Scheme 6 – “one huge skylight” – was an extreme condition included only to better understand the maximum amount of daylight we could harvest using a conventional means. One of the major strong-suits of Radiance is the ability to identify potential areas of pathology. By pathology, we mean glare. This is particularly true in the luminance (light reflected from objects) arena. The image at left shows the potential sources of glare from the east facade in the “no skylight” scheme. 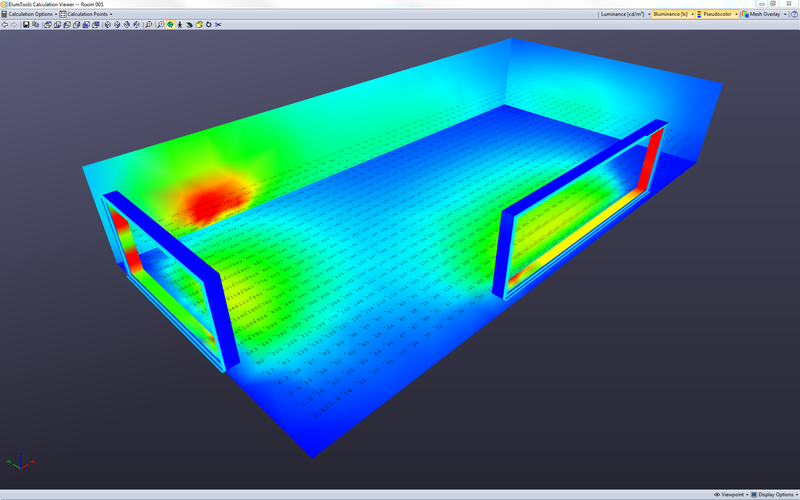 It was clear from the luminance simulations that we would have to add significant amount of lighting on the ceiling (either electric or skylights) to avoid glare conditions as well as achieve minimum lighting levels. The lighting distribution is not only uneven, it is low (an average of 36.08 foot candles…keep in mind: that includes the areas near the east glazed facade). From this analysis we knew we would need something closer to the 3rd or 4th skylight schemes shown above. Midway through the design process, we switched from skylights to Solatubes. Solatubes provided more design latitude within the structural grid, as well as a more cost-effective solution than the large skylights in the early schemes. We had seen a number of other projects that had used light tubes in similar spaces and decided to undertake a number of studies and simulations to determine the optimum number and configuration. Now for the surgical approach: we wanted to test the overall lighting conditions for each scheme in a similar fashion to the skylights using the Radiance workflow outlined above. However, there are a number of challenges with modeling this number of lights in Radiance. Radiance is notoriously difficult to use. Though not impossible, we would have had to 1) create Radiance lights to mimic the performance of Solatubes and 2) suffer extremely long simulation times due to the large number of luminaries. This would have been too slow and difficult given the tight project schedule. Instead of using Radiance, we opted to use the Exposure features in 3DSMax. This had a couple advantages: 1) we were able to attain IES files for the Solatubes from the vendor to accurately model the tubes performance; 2) Exposure is very fast, allowing us to move the virtual Solatubes around to achieve the optimal lighting distribution; and 3) Exposure has been validated by the National Research Council of Canada by Christoph Reinhart, an expert in lighting simulation and Radiance. This fast iterative workflow with Grasshopper to generate the schemes and Exposure to test them allowed us to provide a compelling daylight solution in a short period of time. If a scheme needed a little more work, we could manually move the Solatubes around and target the areas that needed more light, all the while getting Illuminance and Luminance feedback in near real-time. Though Exposure’s results may not be as photometrically accurate as Radiance, they are within a reasonable tolerance. Being able to import the IES file into 3DSMax (and by extension, Exposure) was crucial, as we did not have to guess and check our Radiance lights. This is the first time we felt we were truly able to design with daylight simulation in a meaningful and accurate way. In the next post in this series, we will return to the exterior facade to talk about the BIM process and how we pushed the limits of Grasshopper and Revit to create a coordinated set of documents of the Med Mart facade which allowed us to design up to the last minute. Im really enjoy to simulate solartube…. I chose it for my final project at my university….. I really want a programe for do it… please help me, who can? 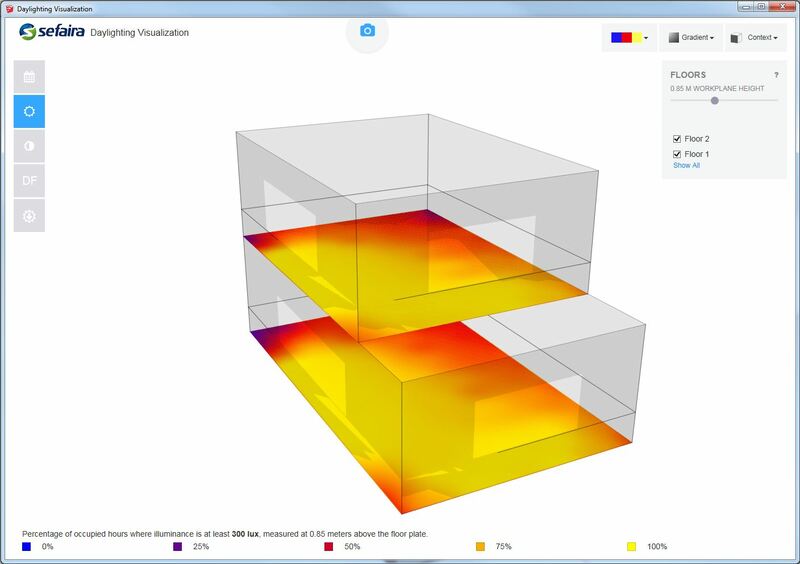 It was a challenge to figure out a reasonable way of simulating the solatubes. We did simulations using both Exposure in 3dsMAX and using Radiance. In both cases we simulated the solatubes as a planar disc that emitted an estimated light level given literature we found. It was a fairly rough study, and we were mostly interested in seeing how the density was effecting the distribution of light. Let us know what approach you end up taking and how things turn out.